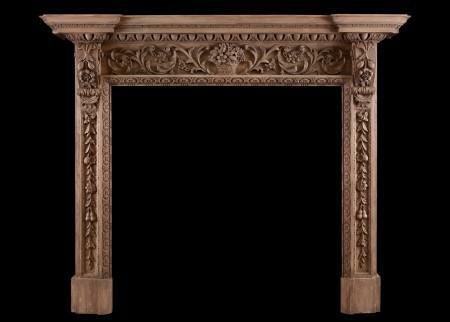 At Thornhill Galleries, we have a large selection of elegant English and Irish antique wood fireplaces, a variety of high-quality Georgian, Regency and Victorian originals, hand carved in pine, oak, walnut and mahogany. 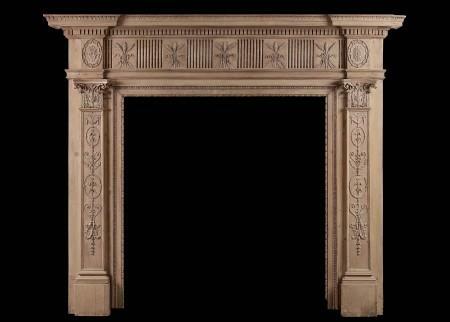 Many English fireplaces feature detailed carvings of foliage and scenes of nature, evocative of the traditional English countryside, while others are simpler in design for a unique, understated finish. 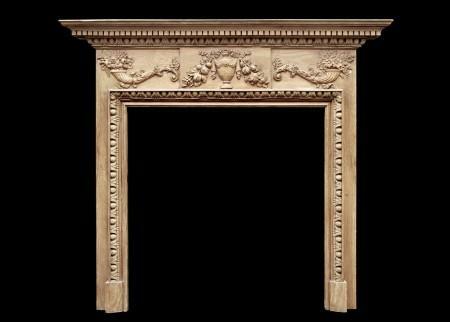 As traditionally antique wood mantels were usually painted, an alternative to carved wood was the use of gesso, a composition which gave the detail of really carving at a much cheaper cost than carving. 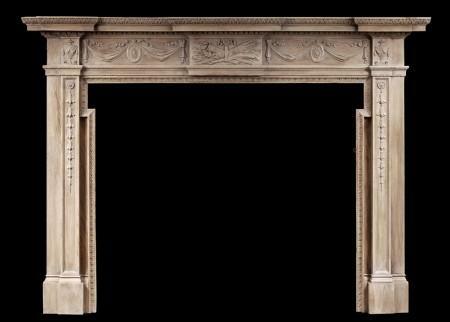 Reclaimed fireplaces are available in a variety of sizes, enabling you to source something to make the perfect addition to your living space. 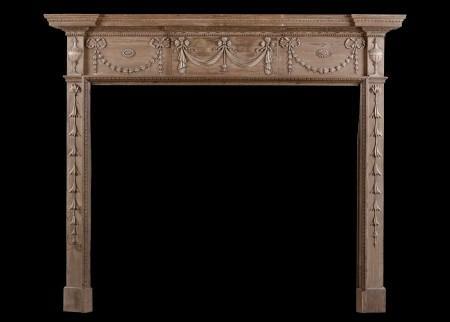 Beautifully crafted and majestic, a traditional English or Irish wooden fireplace is truly something to be admired. 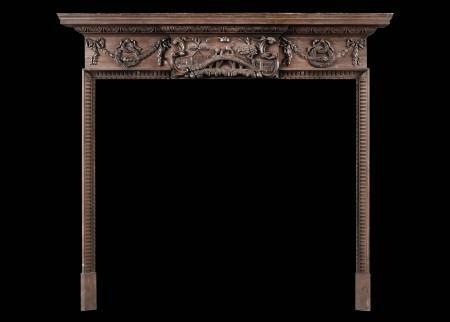 To find out more about any of the carved wood antique mantles in our collection, get in touch with Thornhill Galleries today. 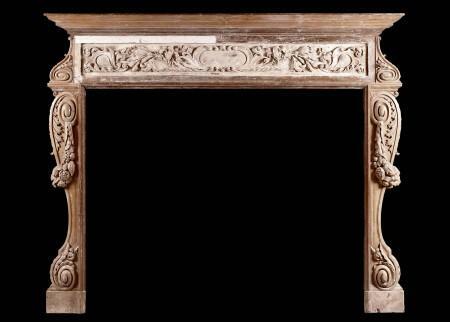 An unusual English wood fireplace with gesso adornments featuring life of the sea. 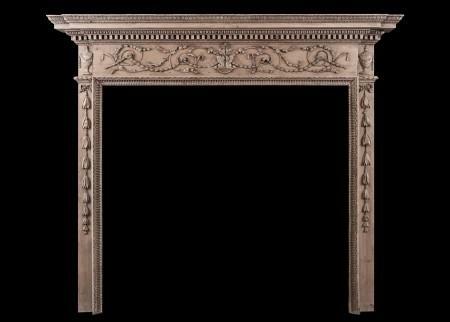 The frieze with foliage, shells and coral throughout, the end blocks with anchors and seaweed. 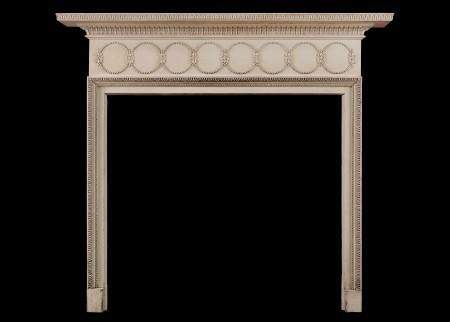 Fluted jambs with delicate inner rope moulding and beading. The breakfront shelf with swags and beading. Late 18th century. A very special piece. 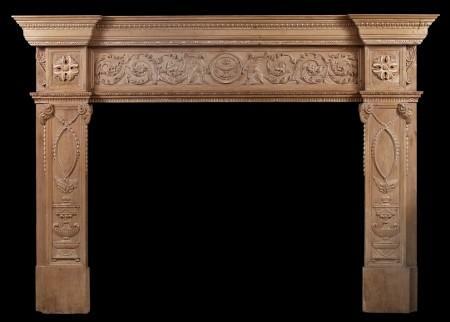 A finely carved pine George III style fireplace. The frieze with recurring palmette and bellflowers throughout, with classical urns to end blocks. The jambs with tied ribbons and belldrops. The shelf with dentils and acanthus leaves. English, 20th century. Still painted white and photo’d prior to restoration, however could be stripped and waxed if required. 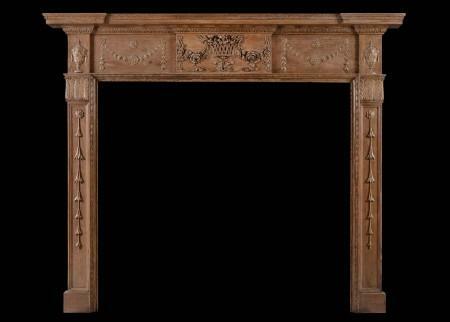 An English carved pine fireplace in the Georgian manner. 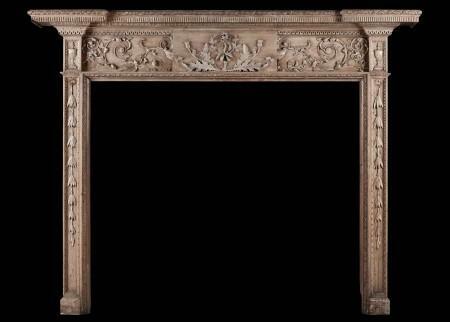 The frieze with carved flowers and foliage with rectangular paterae to ends. 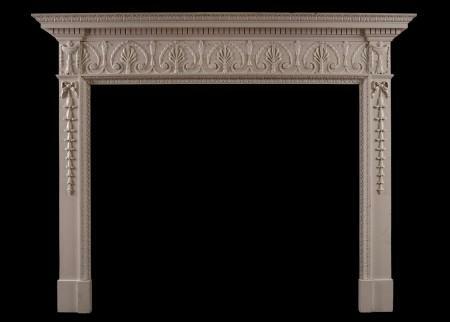 The jambs with decorative inner moulding and cascading foliage to outside. The shelf with dentils and carving throughout. 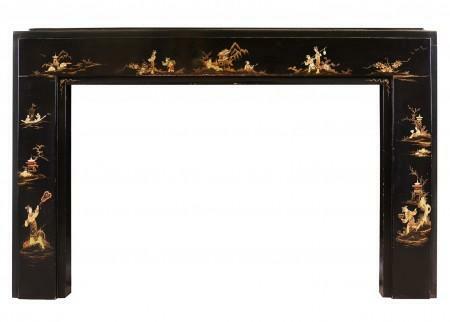 A beautifully carved piece. 19th century. 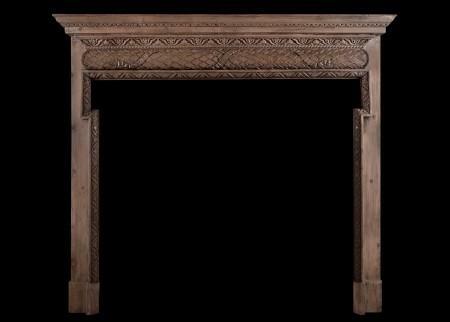 A large English carved pine mid Georgian fireplace. 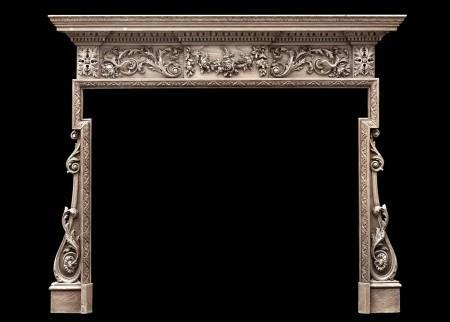 The ogee shaped frieze with flowers and scrolled leafwork detail, and leaf inner moulding to frieze and breakleg jambs. 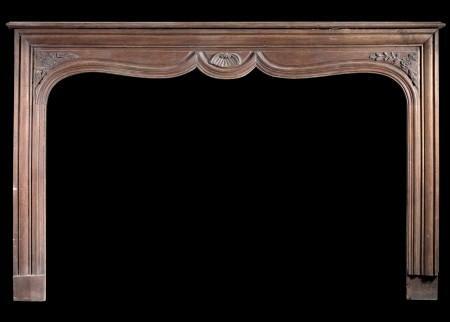 The inverted breakfront shelf with carved foliage and flower mouldings. 18th century. Photo taken prior to restoration. Plinths could be added if required, which would raise the height. 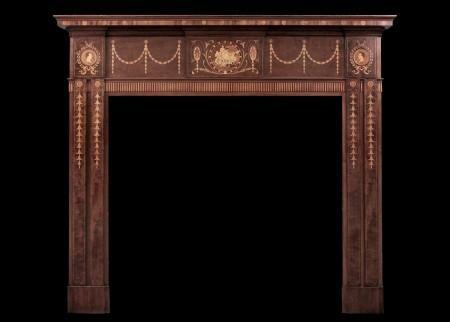 A good quality and unusual early 19th century pine fireplace. The carved centre plaque depicting the Aesop’s fable of “The Dog and Its Reflection.” The frieze with swags and floral garlands with tied ribbons to side panels. Fluted and carved leaf detailing to jambs. 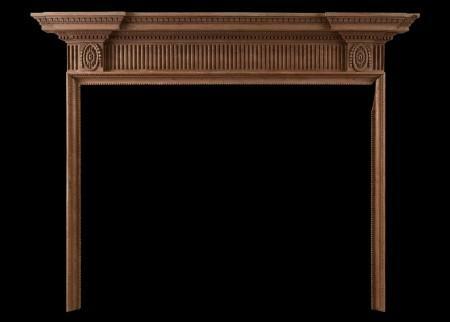 Carved leaf and dart moulding to shelf. Scottish, from a mill house near Edinburgh. 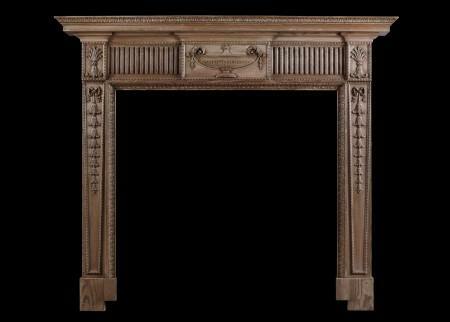 A carved English pine fireplace. 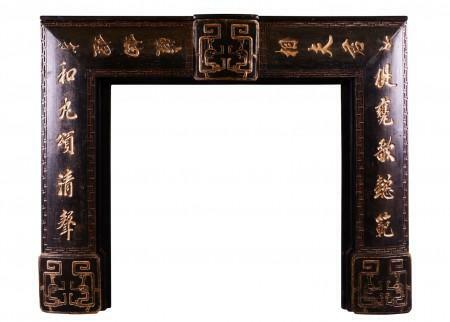 The jambs with carved bellflowers surmounted by cartouche. 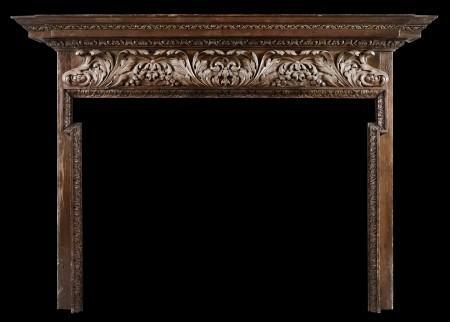 The frieze with central blocking featuring heavily carved flowers, acorns and leaf work, flanked by scrollwork. 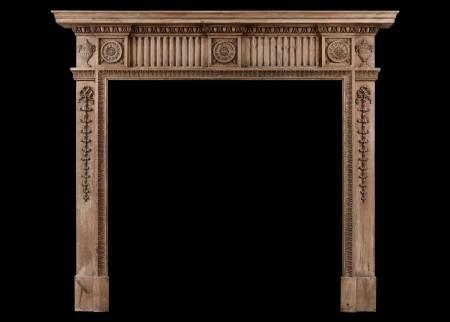 The shelf with dentils throughout, and acanthus leaves above. 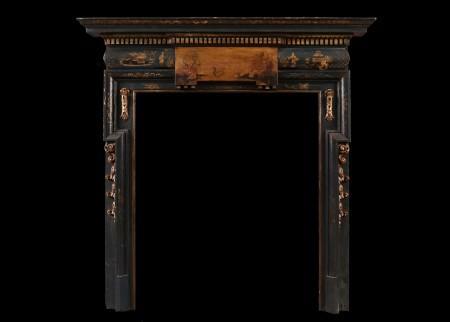 A painted, faux marble wood and gesso fireplace in the Adam style. 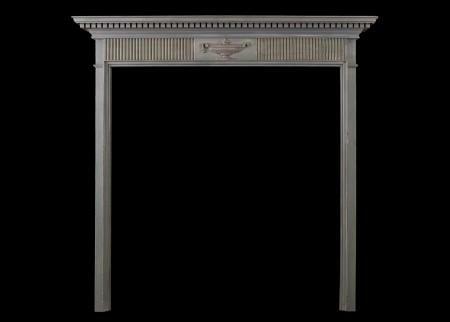 The jambs with cascading drapery, surmounted by neo-classical urns. 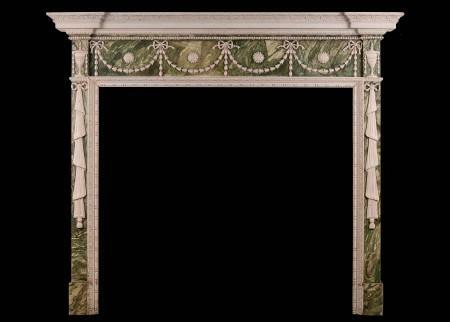 The frieze with belldrop swags, tied ribbons and paterae throughout. The breakfront shelf with beading below. 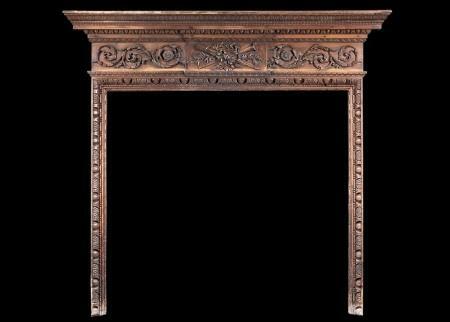 A large and rustic antique wood fireplace. 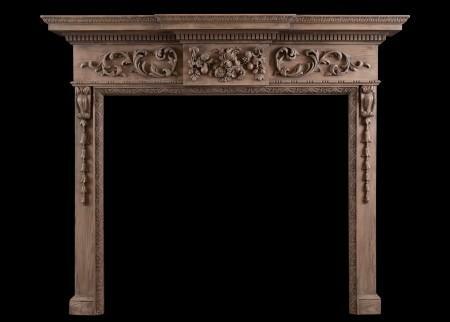 The carved frieze with foliage and cartouche to centre, the legs with scrolls and cascading fruit. Moulded shelf above. English, mid Georgian (circa 1740). Currently in its rustic state, prior to any restoration. 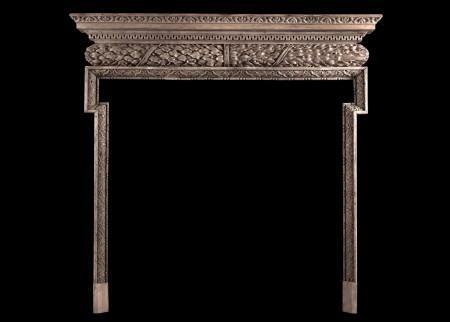 An English pine fireplace in the Georgian style. 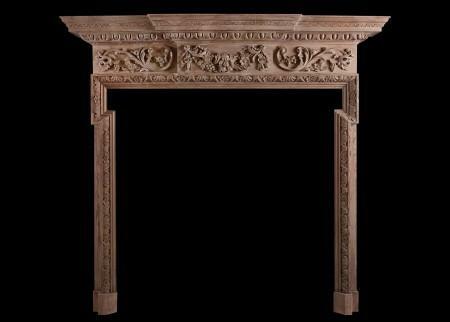 The frieze carved with swags, flowers and berries.The break-leg jambs with carving to ingrounds, the shelf with egg and tongue moulding. 20th century. 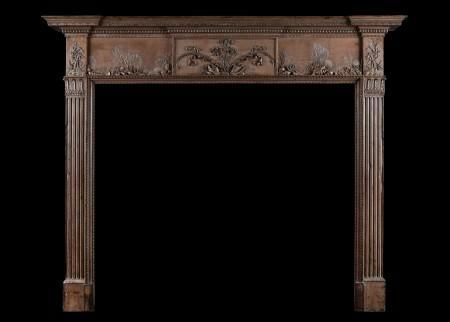 A large English wood fireplace in the Georgian style. 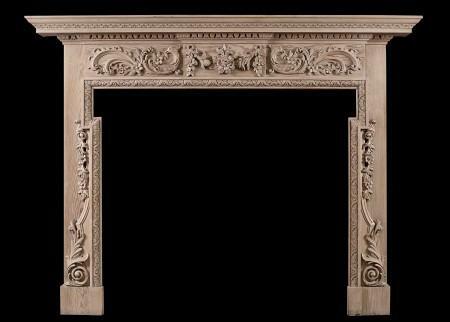 The carved frieze with drapery and pateras, with centre blocking featuring quiver and foliage. The panelled jambs with carved bellflowers, surmounted by urn end blocking. Carved inner leg moulding. 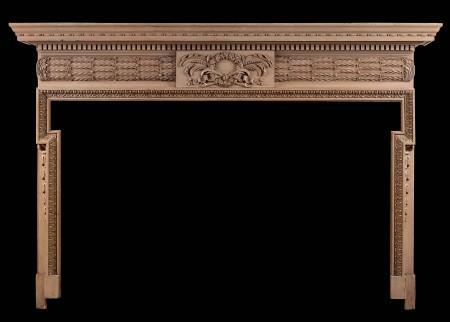 The breakfronted shelf with carved acanthus leaf bed moulding. 19th century. 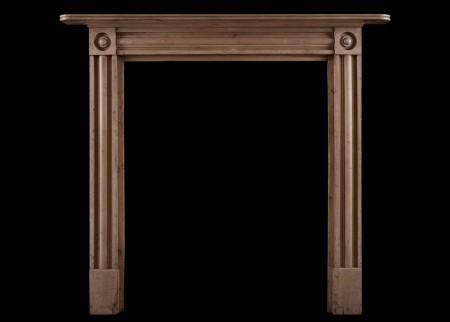 An imposing period English Regency pine fireplace. 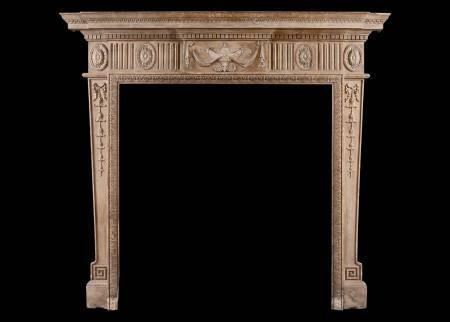 The finely carved jambs featuring urns and swags surmounted by carved rams heads, the end blockings with carved round paterae, the frieze with delicately carved floral scrolls and winged mythological figures and urn to centre. Moulded breakfront shelf. Early 19th century. 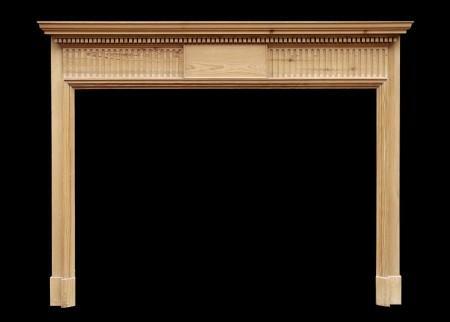 An English pine fireplace with fluted frieze surmounted by dentil cornice and moulded shelf. 20th century.